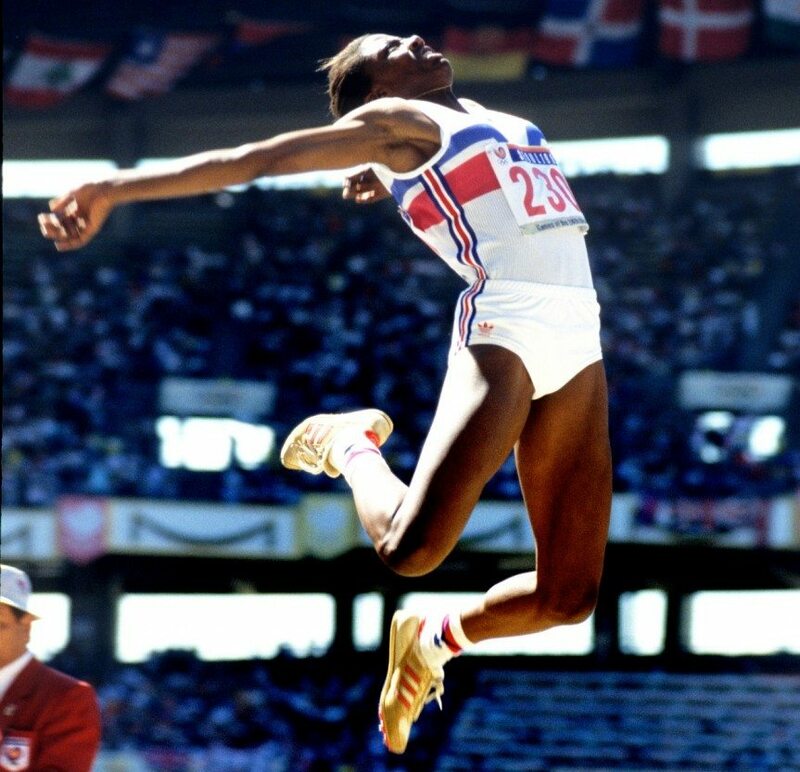 After being the only British winner at the inaugural World Junior Championships in Canada in 1988, May made the Olympic team for the Seoul Olympics that summer, finishing sixth in the long jump final at the age of 18, and looked set for a bright future for GB. 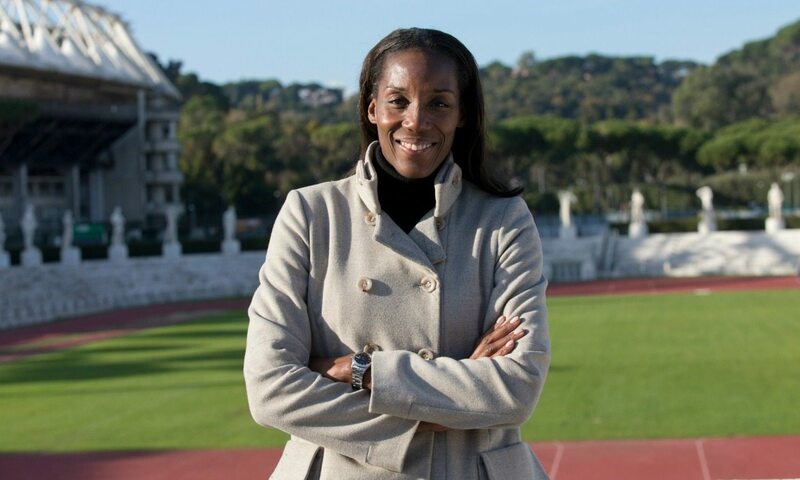 That bright future would see her leaping a PB of 7.11m when claiming silver at the 1998 European Championships – only it was to be in the colours of Italy after she married an Italian pole vaulter in 1994 and moved to Florence. She won gold for her new country at the 1995 and 2001 World Championships, together with Olympic silvers in 1996 and 2000. In contrast to the controversy surrounding the import of “plastic Brits” today, the Italian public and media regarded May as not so much plastic, but fantastic. The 46-year-old May takes up her life story. “After graduating from Leeds University, Trinity and All Saints College and after a pretty disastrous Olympic Games in Barcelona, I returned home and decided to go on holiday to Italy and sort out my head. I’m still on holiday!” she says, tongue firmly in cheek. After 11 years competing for Italy, May decided to quit in 2006. Due to an advertisement she was doing with her daughter Larissa, she was asked to do an audition for a TV fiction series Butta La Luna, starring as the leading character. Despite having no acting experience, she was given the part and was working on the set for nearly three years for RAI, the Italian equivalent of the BBC. The series told the story of a young pregnant Nigerian woman who came to Italy in the 1980s and experienced racism and problems relating to social integration. It quickly became clear that long jumping was not the only one of May’s talents because as soon as she finished filming the second series, she was approached to do a short film in English called Guinea Pig. May won the Italian Globo D’oro best actress award for that film. While filming the second series of Butta La Luna, May became pregnant with Anastasia. “That was quite funny, as there were scenes that were quite dramatic and I wanted to vomit during the first three months, as my daughter was kicking like hell in my stomach,” says May, with a laugh. May stepped away from the acting scene to spend time with her girls, but after a couple of years she wanted to get back into sport. In 2012, she worked for Italian Sky Sports on the London Olympic Games. She was in the mixed zone, speaking to athletes and working in the studio. “I managed to interview all but three Olympic champions, which isn’t easy but it was fun. It was nice to be back in London,” recalled the Slough-born May. However, after the London Games, May wanted a different challenge so decided to enter the political side of sport. She spoke to one of the candidates for the presidency of the Italian Olympic committee and was elected as one of two representatives for athletes in the executive commission. However, she clearly made an impression as after two years, she was approached by the newly-elected president of the Italian football association to set up a commission for integration. She did not accept the job at first, as she thought that it would be a daunting task, especially as there had been incidents in stadia in Italy. However, it wasn’t long before May was relishing the challenge. If May wasn’t juggling enough roles and responsibilities already, she is also promoting Rome’s bid to host the 2024 Olympics. This entails going around Italy to schools and major sporting events, as well as travelling abroad. She had been asked to join the bidding team by the two presidents, Luca Cordero di Montezemolo, the former chairman of Ferrari, and Giovanni Malago, the head of the Italian Olympic committee. May has particularly fond memories from the English Schools and representing her county, Derbyshire. She recalled: “The English Schools formed me to what I am today. I distinctively remember the call room, well, it wasn’t really a call room as we were cooped up like sheep in a pen! There, you can win or lose a comp before you step foot on the track. Talk about rivals trying to psych you out. That prepared me for the later years in my career. Indeed, May recalled one occasion in particular where she experienced the highs and lows of elite-level sport. At the inaugural World Juniors in Athens, she qualified easily for the final. Her first jump in the final was initially measured at 6.90m, which would have been a world junior record. May bounced back to take gold two years later and clearly remembers the words of her coach when she returned home, which subsequently made her more determined for the rest of her career. “He said that I competed well, beating the Eastern Block athletes and nearly got the British record. But he said that it would probably be the last time that I would win a gold medal. This remained in my head for years, as I wanted to prove him wrong and I did,” she laughed. Fast forward 30 years and May still tries to keep active. She often works away from home so has no set schedule, but when she is at home, she typically gets up at 5.30am and does some yoga and meditation before breakfast. She wakes up her daughters at 6.15am to get them ready for school. She drops them at the bus stop at 7.20am and returns home to clean and do admin work. Larissa started doing athletics last year, so May takes her training, but does not coach her. Anastasia plays tennis nearby, so May spends many afternoons dropping them off and picking them up. If they aren’t doing sporting activities, they have piano lessons, but the teacher comes to their house. Then its homework and dinner and once the girls are settled, May likes to relax by reading. Although she misses the fun she had as a junior athlete, May is more than content with her life now and does not miss being an elite athlete. “I dedicated my life to athletics, but I knew that my athletics wouldn’t last forever. I was lucky that I found something else pretty quickly,” she said. At the moment, May is working on organising a sporting event in Florence for youngsters, although her multiple roles do not allow much time for other projects. But fortunately, she loves what she is doing and is quite relaxed about adapting to whatever comes along. May has a simple and non-materialistic outlook. It is one that May has proved to be effective in all areas of her life and one that is ensuring she remains in high demand among numerous sporting organisations. Tags: Action photo credit: Mark Shearman, Emily Moss, Fiona May, Long jump, Where are they now?